Manfred Mann were a popular British rock group active in the 1960s. 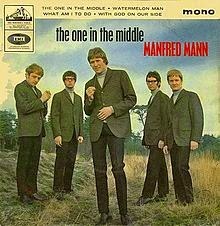 Between 1963 and 1969 Manfred Mann released twenty-two singles and four albums. However that was not all, as they were also prolific on the EP market, releasing eight EPs in a two year period, most of them featuring songs which were not repeated on the albums and singles. The EPs featured some very interesting music. 1965's The One In The Middle featured their first Bob Dylan cover, a great arrangement of "With God On Our Side". Two of the EPs from 1966, Instrumental Asylum and Instrumental Assassination, featured some very good jazz instrumental versions of recent pop songs of the era (among them "Wild Thing", "Satisfaction" and "I Got You Babe"). The band handled jazz very well, with drummer Mike Hugg doubling on vibraphone. Instrumental Asylum also featured bassist Jack Bruce during his brief stint with the band (he also appeared on the hit single "Pretty Flamingo"), plus horn players Henry Lowther and Lyn Dobson. This thirty-five song collection compiles all of these EP tracks, plus a few other loose ends, including b-sides which didn't appear on any of the albums, and a few songs which were only featured on the UK compilation albums Mann Made and Soul Of Mann. Together with the albums The Five Faces Of Manfred Mann, Mann Made, As Is and Mighty Garvey!, plus The Singles, this should give you the entirity of the band's released work.